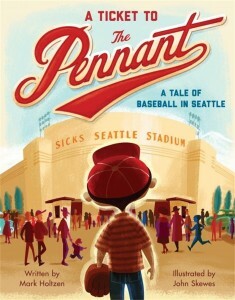 Before the Seattle Mariners, there were the Seattle Rainiers…This nostalgic, historically accurate picture book follows Huey through the Seattle of 1955 exploring a diverse and charming neighborhood surrounding the baseball stadium. Featuring the vibrant retro illustrations of Larry Gets Lost creator John Skewes, this is a story of baseball, civic pride, and how baseball unites communities. – Read full Kirkus Review here. 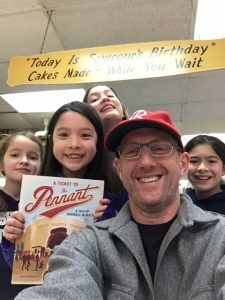 Want to read more about the inspiration for the book or read more about the Rainiers? Visit the below links. Here is a blog post with Photos that served as inspiration for the story. A Pinterest page with collected images. There are two book trailers: this if you’re feeling nostalgic, this for cute & goofy. Dave Eskenazi wrote many columns on SportsNW about local baseball history. A post with an essay about the team and Sicks Stadium history in South Seattle. A TV interview with Evening Magazine featuring author and illustrator. An interview in Seattle’s Child Magazine about “soul” of place. A fun author interview on “The Winged Pen” children’s lit blog. Consider using the embedded map below to take a real live tour along the Rainier Valley to visit the sites and businesses as they are today. Common Core guide by Sasquatch Books for use with A Ticket to the Pennant.